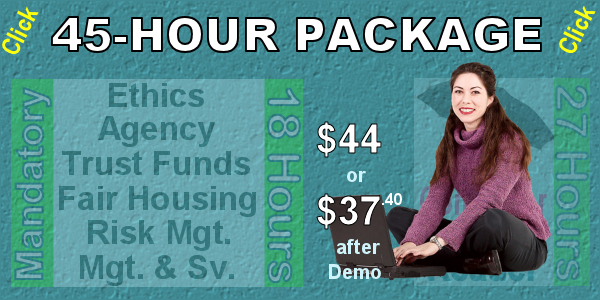 We provide one package guaranteed to provide everything needed to renew ANY license! Textbooks cite only California law and California institutions and are current as of March 1st, 2018. Outstanding textbooks (see product pages for links to samples); (endorsements). Support available usually by phone but always by e-mail. Textbooks and exams are the minimum length permitted by the DRE. 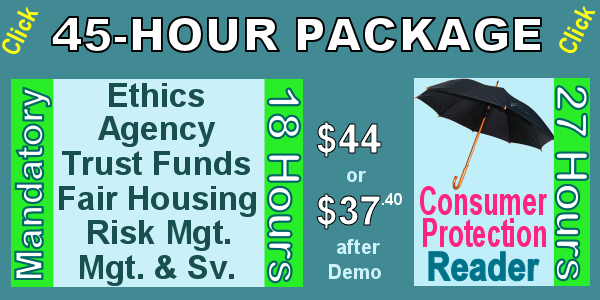 If referred to us by one of our customers (providing that customer completed at least one course), we give you a 25% discount . We provide quizzes for each course to help you prepare for each course’s final. Large type which everyone can read. 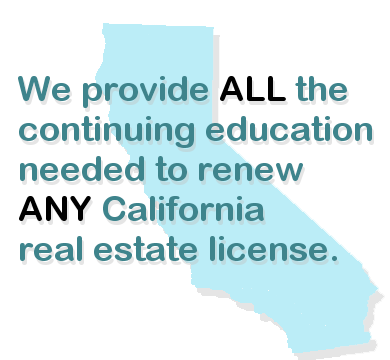 We have been providing California licensees with their CE since 2006.